Inside the Scriptcase Charts can be created also within the Grid application, however the application Chart has more settings options to the end user within the application generated. The idea is to apply the concept of Business Intelligence so the final system users can apply their own settings within the generated charts. The settings within the development area uses Drag and Drop for the charts creation. You can apply dimensions and metrics dynamically using different date periods and totals. Dimensions are used to group the data into categories. You can choose more than one field as a dimension, each new field as a subcategory of the previous field. 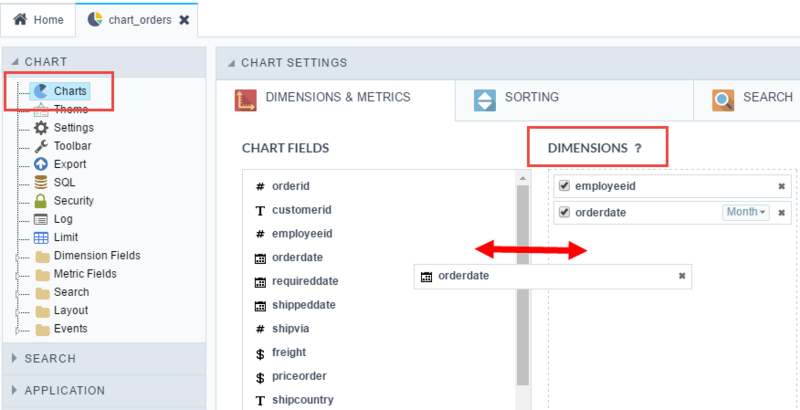 To select a field, click on its name in the “Chart Fields” area and drag it to the “Dimensions” column. Once selected the fields, you can sort them using the drag and drop to arrange the dimensions’ final display. 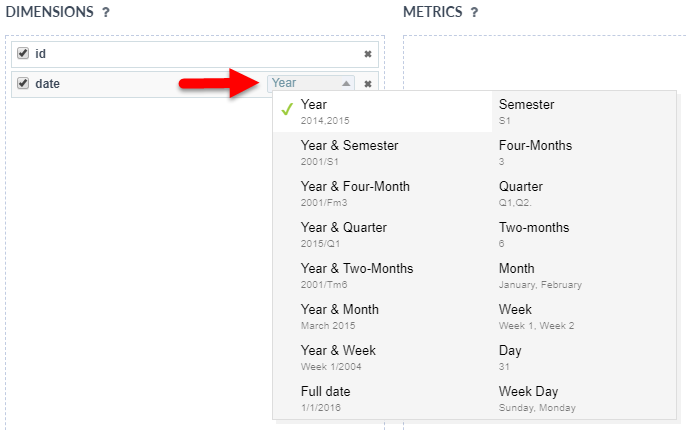 You can choose different periods to date fields and use the same date field more than once, with different periods. All the dimensions listed in “Dimensions” can be used by the system final user within the Chart application. You can also define whether dimensions will be displayed or not when you start the application by selecting the checkbox. The metric is used to quantitatively view the data grouped by dimensions. Choose the fields for the chart’s metrics. To select a field, click on its name in the “Chart Fields” area and drag it to the “Metrics” column. Once selected the fields, you can sort them using the drag and drop to arrange the metrics’ final display, you can also chose the total function according to the field data type. All the dimensions listed in “Metrics” can be used by the system final user within the Chart application. You can also define whether metrics will be displayed or not when you start the application by selecting the checkbox. The checked field value is used to set the default field just when you are not using a combination or stacked chart types, that use more than one field. If you choose more then one field Scriptcase automatically sets a value multiple chart type (Combination). You can change the initial chart inside the option “Charts’ type” within the “Settings”. When you check a single value (bar, line, Spline, step, Area, pie, pyramid, funnel, Radar and Gauge) you have to click and choose only one field to appear as initial value during the first generation. 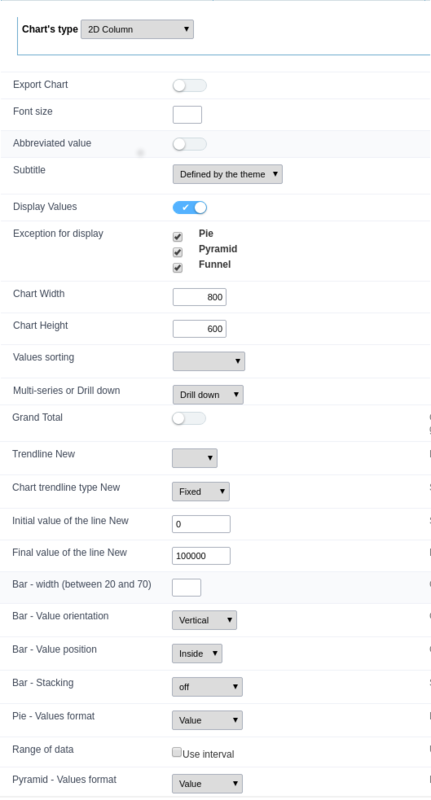 You can select which chart value will be ordered to start the application, and if the sort will be “ascending” or “descending”. Initial sorting : Using this option you can set the default sorting (ascending or descending). The system final user will also be able to customize it within the generated application. Dimension : Application starts with dimension fields sorting (ascending or descending according to the “Initial sorting”). Metric : Application starts with metric fields sorting (ascending or descending according to the “Initial sorting”). In the “Search” option you can choose the fields that will be used as static search on the chart, the application data will be initially filtered according to the settings you apply. The search values are chosen for each selected field during development, the final user will not be able to change that. You are also able to apply other search options such as the Dynamic Search using the option “Search > Dynamic Search” (located on the left menu) and the “refined” search using the option “Chart > Search”. These two types are dynamic, it means that the end user will be able to manipulate them within the generated application. In the tab “Chart” the developer sets other default options for the chart that will be generated such as chart type, color, theme and others. Find more details below. Graph Type: Allows you to set the type of chart to be displayed by “Default” if the Configurable Chart option is active, or the type of chart to be displayed if the option is disabled. Size Size: Font size of the values, if you leave the field blank, size 12 will be assumed. Short value: Value displayed in the chart should be abbreviated. View Values: Starts already displaying the values ​​of the generated graph. Exception for Display: Chart types that will not display chart values, even when marked to display. In these types we do not recommend that the values ​​are displayed, for aesthetic reasons, in the meanwhile, it is up to the developer. Graph Width: Default Width in pixels of generated graphs. __ Graph Height__: Default height in pixels of the generated graphs. Ordenation of values: Sorts the values ​​of the graphs. Multi-series or Drill down: Defines whether the dimensions of the graph will be generated by grouping by multi-series or by drill down navigation. Total General: If you want to group all the values ​​in one, check the Total General option. This option is typically used in Gauge type graphics. __ Trendline__: Defines a line or area for the trend line of the chart. Trend line type: Trend line type. __ Initial line value__: Defines the initial value of the trend line. Value line end: Sets the end value of the trend line. __Barras - Width (between 20 and 70) __: Width of the chart bar. Barras - Value Orientation: Orientation of the value displayed in the graph (Horizontal or Vertical. Barras - Positioning of the value: Positioning of the value in the graph (Above or Inside). Barras - Stacking: Stacks the bars in a single (By series). Pizza - Value format: Format of the data in pie charts. Data Range: Use data range with different colors. Pirâmide - Values ​​format: Format that will display the value in the chart.